MISSION, KS--(Marketwire - December 27, 2010) - (Family Features) Weight loss is perennially one of the top New Year's resolutions amongst Americans, but achieving this goal can be difficult when faced with strict diets and bland food. The key to weight loss is enjoying healthful meals that are tasty and sustaining. This can be an easy feat when eating nutrient dense foods like sweet potatoes. When baked plain and allowed to caramelize naturally without the sugary toppings we're accustomed to, sweet potatoes are a nutrition powerhouse. A medium-sized cooked sweet potato is an excellent source of vitamins A and C, a good source of fiber and only about 100 calories. Luckily, these rewarding roots are available year round with North Carolina producing nearly half of the country's supply. Fiber plays an important role in maintaining weight by slowing down the digestion of food. The longer it takes your food to digest, the longer you'll stay full and the less snacking you'll do before your next meal. This slow digestion also makes sweet potatoes a low to medium glycemic food, so even those with diabetes can enjoy a touch of natural sweetness without causing blood sugar levels to spike. 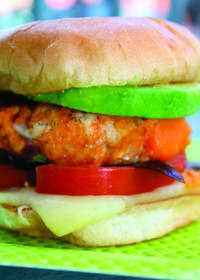 This recipe for guilt-free Sweet Potato Burgers is a great alternative to the typical high calorie all meat burger. For a lighter alternative, skip the bun and place the patty over a bed of greens with avocado slices and your favorite salad dressing. For more sweet potato recipes and nutrition information, visit www.ncsweetpotatoes.com or www.sweetbytesblog.blogspot.com. In small pan over medium heat, heat 1 teaspoon oil. Add onions; cook and stir until slightly soft, about 1 minute; set aside. In large bowl, mash together sweet potatoes, turkey, salt, cumin and reserved onion. Form eight 4- to 5-ounce patties. In large pan over medium heat, heat oil; cook until cooked through, about 5 minutes per side. Assemble burgers with your choice of toppings. The natural sweetness and fiber in this burger will surely keep your cravings at bay.